A 12-year-old girl who was last seen leaving for a friend's birthday party has vanished, leaving her mother and investigators stumped as to where she might be. PHOTO Kayleah Wilson was last seen Sunday afternoon when she left her mom?s Greeley, Colo., home to go to a friend?s birthday party. Kayleah never returned. "We do not believe Kayleah ran away. There is nothing to indicate she did," said Sgt. Joe Tymkowych, a Greeley Police spokesman. "We just haven't been able to come up with anything that indicates what may have happened." When Kayleah Wilson of Greeley, Colo., didn't come home Sunday evening from a birthday party that was supposed to end by 7 p.m. her mother, April Wilson, became worried. She also never arrived at the party, police said. "She's never run away before," said Wilson. "I am worried she may be in danger because none of her friends have seen her, and it is like she just vanished, but that's not possible." Kayleah, who is in sixth grade at Brentwood Middle School, was last seen wearing a white-and-pink shirt over a white tank top, blue jeans and white and red shoes. She is described as being 5 feet 1 inch, and approximately 145 pounds with brown eyes and brown hair. Wilson said her daughter left at 3:40 p.m. Sunday for the party, which was just a few blocks away. "She walked over to the couch and said, 'I love you,' and 'I'll be home by 7,' and she walked out the door and that was it," said Wilson. "She had been talking about the party. She was really looking forward to it." Tymkowych said that since Kayleah was reported missing Sunday evening the search has taken over his police force. "We have about 25 people out on the ground searches and recanvassing the areas where she was last seen," said Tymkowych. "We are reinterviewing a lot of the key figures in the investigation as well." Tymkowych said that dogs had been used in the investigation initially but proved unsuccessful. He said that investigators working the case do not believe Kayleah had any problems with drugs or alcohol, and have not found anyone who may have wanted to harm her. "We have no evidence that there was any foul play," he said. "At this point, everything is still a question mark for us." The eight-block area where Kayleah would have walked to get to the party is well-populated and safe, according to authorities, who are still looking alongisde a busy highway that runs behind her home. Even so, Wilson said that she had no concern about her daughter walking alone and that the neighborhood is not dangerous. "We all walk everywhere, we don't even have a car," said Wilson. "It's not a bad neighborhood." Wilson describes her daughter as "loving" and "trusting," and said that she's always been well-behaved, except for a recent incident involving an older boyfriend. According to Wilson, Kayleah had been seriously involved with a 17-year-old who was friends with her older brother, but the couple had broken up a few months ago. Other than that, Wilson said her daughter is a typical preteen who has a crush on one of the singers from the folk band Celtic Thunder. "I just want everyone to help find her. I don't care if you're in this state or in another country, just help," said Wilson. WELD COUNTY - Greeley Police are stepping up their search for a missing 12-year-old girl. Kayleah Wilson vanished on Sunday while walking from her house to a friend's birthday party. Kayleah left her house around 3:40 p.m. Sunday for the 8 to 10 block walk to her friend's house. Police say she never arrived. She also never returned home. Her mother called police around 10 p.m. Sunday night to report her missing. Greeley Police say initially this was written up as a possible runaway. When detectives interviewed her family and other witnesses on Monday morning, they found no evidence she ran away. They can't say there was foul play, because there is no evidence of that either. Greeley Police have already searched the area near her home and interviewed witnesses. Sgt. Joe Tymkowych says 20 to 25 people are helping with a selective ground search and the investigation on Thursday. This is in the area of U.S. 34 bypass and between 17 and 35th Avenues. Detectives also plan to re-interview witnesses and try to develop new ones. Sgt. Tymkowych says there is a lot of traffic in the area with shops and restaurants. "We're hoping someone saw or heard something," Tymkowych said. He says the reason why an Amber Alert was never issued for Kayleah, is because the alert is for abducted children and there is no evidence of an abduction and there is no suspect. Kayleah is described as 5-foot, 1-inches tall, 145 pounds, with brown eyes and brown hair. She was last seen wearing a white and pink shirt over a white tank top, blue jeans and white and red shoes. She is a student at Brentwood Middle School. Anyone with information about this case is asked to contact the Greeley Police Department at 970-350-9600. Another case of considered a runaway at first. No Amber Alert. Anyone with information about Kayleah Wilson is asked to call the Greeley police at (970) 350-9600. A morning search by police of the areas around Kayleah Wilson's home produced no new evidence and nothing to show what happened to the 12-year-old. Wilson left her home Sunday afternoon to go to a friend's birthday party and never arrived. She didn't show up at the pick-up location, and she hasn't come back home since. Greeley police have been on the case since Sunday night, when it was reported, but no sign of the missing girl has turned up. Scent dogs were brought in Tuesday, but no trace of the girl was found. Police said it was probably too much traffic in the area and too long since the girl disappeared. Numerous officers searched the areas between the Wilson apartment in the 2800 block of 28th Street and U.S. 34 Bypass. They think she may have crossed the highway while walking toward the Greeley Mall. Kayleah is described as 5-foot-1, 145 pounds, with brown hair and brown eyes. She was last seen wearing a white and pink shirt over a white tank top, blue jeans, and white and red shoes. She is a student at Brentwood Middle School. According to the Greeley police bulletin, there are no indications she uses drugs or alcohol and has no history with gangs. She also has no history of running away from home. Kayleah has asthma and will likely be carrying an inhaler. She does not have a cell phone and usually walks to various places to meet her friends. Her family said she likes to hang out at the Centennial Park Library, the Greeley Mall, Walmart on 23rd Avenue, and Hastings music store. She also goes to the Higher Grounds Youth Center, in connection with her church. No Amber Alert was issued for the girl, because her disappearance doesn't meet the state criteria. A successful abduction leaves no witness..
what is wrong with these police ? A Amber alert should have been launched as a precaution because they Have NO WITNESS. You also have no history of drug use or CPS or bad grades or anything to indicate a run away. The lack of common sense in law enforcement is astounding these days.. This girl can be anywhere by now. As of the census of 2000, there were 76,930 people, 27,647 households, and 17,694 families residing in the city. The population density was 2,572.5 people per square mile (993.4/km²). There were 28,972 housing units at an average density of 968.8/sq mi (374.1/km²). The racial makeup of the city was 55.4% White, 1.87% African American, 0.83% Native American, 1.15% Asian, 0.14% Pacific Islander, 13.77% from other races, and 2.84% from two or more races. Hispanic or Latino of any race were 34.49% of the population. If you drive past the Wilson apartment on 28th Street in west Greeley, you can see April Wilson or her son, Mackenzie, watching out the door. The 12-year-old girl left her home Sunday afternoon to go to a friend's birthday party and never arrived. She didn't show up at the pick-up location, and she hasn't come back home in two days. Greeley police issued a bulletin Tuesday with Kayleah Wilson's photo on it, asking for help in finding the girl. Her home is in the 2800 block of 28th Street. 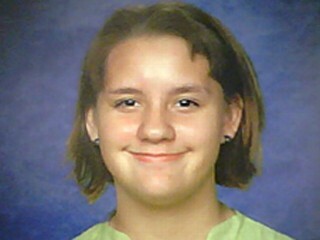 Kayleah is described as 5-foot-1, 145 pounds, with brown hair and brown eyes. She was last seen wearing a white and pink shirt over a white tank top, blue jeans, and white and red shoes. While mom was talking, 17-year-old Mackenzie rushed out and gave a flier to a pedestrian walking past the house. He said he's been out driving around, looking for his sister. Tymkowych said this missing child case does not meet the criteria for an Amber Alert. He said to issue the alert, police have to believe the child has been abducted. The No. 2 criteria for an alert says the abducted child must be “in immediate danger of serious bodily injury or death.” Tymkowych said police haven't found evidence to meet that criteria. Kayleah is a student at Brentwood Middle School and has several friends in that area. "except for a recent incident involving an older boyfriend." Another within the search area. There appears to be several apartment complexes facing the highway on 28th Street. He needs to be eliminated .. I would suppose LE already has. With this much attention by volunteers and professionals.. The situation is not good. Page created in 10.138 seconds with 21 queries.